Menulog delivers for The Crepe Cafe so you'll be able to track your courier on a map. Diced bacon, cheese and egg. Scrambled eggs, fresh herbs, cheese and toast. Two bacon rashers, two fried eggs, bubble and squeak on toast. One toast, one fried egg, baby spinach and Hollandaise sauce. One bacon rasher, one fried egg with a cheese, hot dog sausage and BBQ sauce crepe. Mushrooms, cheese, spring onion, tomato, corn and fresh herbs. Shredded ham, tomato, cheese and fresh herbs. Diced bacon, mushrooms, cheese and fresh herbs. Chicken, corn, cheese, spring onions and fresh herbs. Smoked salmon, baby spinach, cheese and fresh herbs. Bacon rasher, egg, cheese and BBQ sauce. Diced bacon, lettuce, tomato, cheese and mayonnaise. Spicy beef, cheese, beans, guacamole and sour lite cream. Marinated lamb, cheese, spring onion, tzatziki sauce and lettuce. Smoked salmon, cheese, asparagus, spring onion and bechamel sauce. Mixed seafood, creamy mornay sauce and cheese. Mushrooms, cheese, pineapple, spring onion, corn and Napoli sauce. Mushroom, cheese, feta, spinach and bechamel sauce. Chicken, cheese, tandoori sauce and sour lite cream. Chicken, cheese, mushrooms and bechamel sauce. Three pancakes, maple syrup and butter. Two pancakes served with warm apples toasted with cinnamon sugar and ice cream. Maple syrup, ice cream and fresh whipped cream. Choose either strawberries, bananas or mixed berries with maple syrup, ice cream and fresh whipped cream. Two chocolate chip pancakes, fresh strawberries, chocolate sauce, ice cream and fresh whipped cream. Five pikelets, bananas, crushed macadamia nuts, caramel sauce and ice cream. Choice of maple syrup, caramel, chocolate sauce or jam. Dusted with icing sugar. Chocolate centered and chocolate sauce. Dusted with icing sugar. Choice of fruit. Choice of sauce. Dusted with icing sugar. With your choice of topping. Served with butter. Nutella crepe served with fresh whipped cream. Butter, sugar, orange syrup, ice cream and fresh whipped cream. Warm apples, cinnamon sugar, sultanas, almond flakes, ice cream and fresh whipped cream. 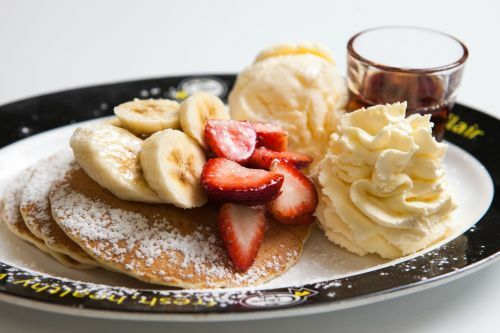 Fresh bananas, ice cream, fresh whipped cream and your choice of sauce. Fresh bananas, chocolate buttons, chocolate sauce, ice cream and fresh whipped cream. Fresh bananas and strawberries, ice cream and fresh whipped cream. Fresh strawberries, chocolate buttons, chocolate sauce, ice cream and fresh whipped cream. Fresh strawberries, almond flakes, strawberry syrup, ice cream and fresh whipped cream. Chocolate crepe, nutella, fresh strawberries, almond flakes, coconut, marshmallows, chocolate sauce and ice cream. Dusted with icing sugar. Chocolate crepe, chocolate buttons, mixed berries, chocolate sauce and ice cream. Dusted with icing sugar. Your choice of topping, ice cream and fresh whipped cream dusted with icing sugar. Cinnamon sugar, apples, ice cream and fresh whipped cream. Dusted with icing sugar. Mixed berries, maple syrup, ice cream and fresh whipped cream. Dusted with icing sugar. Fresh bananas, chocolate sauce, ice cream and fresh whipped cream. Dusted with icing sugar. Fresh strawberries, chocolate sauce, ice cream and fresh whipped cream. Dusted with icing sugar.